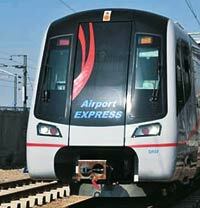 Delhi Airport Express: Reliance Infrastructure eyeing exit route? It was an urban infrastructure showpiece for the country until recently, but the sudden suspension of services has turned the Delhi Airport Metro Express into an expensive eyesore. Merely 16 months after the 23-km high-speed metro rail became operational, connecting New Delhi Railway Station to Terminal 3 of the Indira Gandhi International Airport, its operator, Reliance Infrastructure Ltd, has reported safety defects in the civil structure on the elevated section of the corridor. A DMRC official says Reliance has not been able to meet its initial revenue projections. Built at a cost of Rs 5,700 crore, the airport line is the country's first metro rail project to be commissioned under the public-private partnership (PPP) model. Under the arrangement, the state-run Delhi Metro Rail Corporation (DMRC) completed the civil work, while the Delhi Airport Metro Express Private Ltd, promoted by Reliance Infrastructure and Spanish train maker CAF, was to operate the line for 30 years. While Reliance Infrastructure blames DMRC for the defects, sources in the state-run company claim running the airport line has not been profitable for Reliance and it is preparing the ground to exit the project. A DMRC official, on condition of anonymity, says that Reliance has not been able to meet its initial revenue projections. 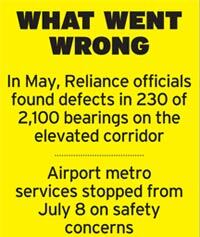 Sumit Banerjee, Reliance Infrastructure CEO, however, said the decision to suspend services was "purely linked with safety". At a press conference on July 7, he also said that "the corridor is not making profits, but we would continue to operate the line." This is not the first time the airport metro line has landed in controversy. It was supposed to be ready before the Commonwealth Games in October 2010 but overshot its deadline by almost five months. Again, in December last year, DMRC's then-chief, E. Sreedharan, threatened to take over the track from Reliance if it did not improve train speed and frequency. Public response to the line has been subdued. Its average daily ridership is 20,000, half of DMRC's initial estimate. Reliance invested Rs 2,880 crore in it, and a back-of-the-envelope calculation shows that, at an average fare of Rs 50 per passenger, ticket sales would generate Rs 1,095 crore - just 38 per cent of its investment - over 30 years. That means it will have to recover the remaining 62 per cent from non-fare revenue sources. While fares and ridership will rise over time, the company will also need money for debt servicing and operational expenditure, which will further affect its bottomline. Mayank Shyam, Director at Traffic Media, one of eight out-of-home media firms working with DMRC, says expecting 75 per cent of revenue from non-fare sources is unrealistic. 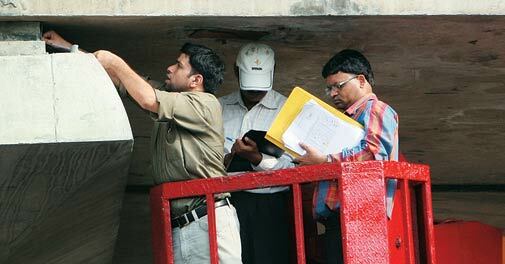 "Property development, especially advertising, in the existing network of the DMRC has completely collapsed. Advertising in the metro is not a profitable venture.Out of eight advertising companies that were working with DMRC, two have terminated their contracts and three others are on their way out," he adds. Even overall, DMRC's non-fare revenue sources have largely underperformed. Globally too, income from property development is lower than revenue from fare collections. MTR Corporation, which runs one of the most profitable metro systems in the world in Hong Kong, earns only 35 per cent from nonfare areas. Critics point out that the public-private partnership (PPP) model has never been successful in metro rail projects, and a Planning Commission working group on urban transport, headed by Sreedharan, has made the same conclusion. Akhileshwar Sahay, a strategic advisor to DMRC who was part of the working group, says it studied 113 cities and found that 90 per cent of metro rail networks were developed and operated by state agencies. "Whether it's Bangkok, Malaysia or London, the PPP model in metro projects has not succeeded," Sahay says. "If Phase-I and Phase-II of the Delhi Metro network are working properly, why is there a problem with the airport line alone." Some industry executives, however, refuse to blame Reliance and criticise the DMRC for its haste. B.I. Singal, Director General of the Institute of Urban Transport, says: "In the past four years, DMRC has built around 125 km of rail network. No country has achieved this rate of construction. It is, therefore, not surprising to hear of such incidents."